Looking for RVs in Montreal? We review 3 local rv hire agencies. Below you will find the most up-to-date list of RV rental companies based in Montreal, Canada.. If you don't know a brand or location you want to rent from, then scroll down to the map at the bottom and choose that way. The most jam-packed city in Quebec, Montreal glitters in summer, with warm temperatures harmonized with the awe-inspiring Mount Royal and the magnificent Montreal Botanical Garden. The northern climate brings everything you want for a fun-filled week or longer. Wander along the lively metropolis that fuses a combination of traditional Europe and modern America. Hop around Notre-Dame Basilica to Montreal Biodome and Saint Joseph's Oratory. Then hit the road and take your RV to the blissful views and experiences that Quebec offers. The most jam-packed city in Quebec, Montreal glitters in summer, with warm temperatures and plenty of tourists. The northern climate brings everything you want for a fun-filled week or longer. Wander along the lively metropolis that fuses a combination of traditional Europe and modern America. Hop around different religious structures or go strolling inside the museums. Then hit the road and take your RV to the blissful landscapes encircling the city. If you are eyeing to visit Montreal this year, best schedule it from mid-May to mid-October. But if you don’t want to run across a crowd of tourists, then avoid visiting from June until August, which is the start of summer. These months are also the peak season for RVing in most parts of Canada. 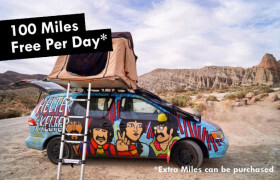 You can plan your road trip during autumn, where the high summer rates and tourist start to subside. From September to October, the weather is much more pleasant so that you’ll enjoy the outdoors even more. Winter in Montreal could be colder than Toronto so you might want to skip the months of December to February. Start off your holiday at Mount Royal Park―a breathtaking oasis for outdoor lovers and touring families. Montreal Botanical Garden is another enthralling destination filled with gorgeous greenhouses and gardens. Then, keep driving south until you reach La Fontaine Park, which is also a verdant urban park for locals and tourists. Just minutes away from the park is the Old Montreal, which is a historical area fringed with cobblestone streets, quaint shops, gothic churches, and an archeological museum. Other popular museums in Montreal include The Montreal Museum of Fine Arts, Biosphere Environmental Museum, Montreal Insectarium, and Montreal Science Centre. Montreal’s food scene is quite fascinating―there are a lot of choices to spoil every foodie. The amazing selection of culinary delights starts with the Montreal-style bagels. Never leave the city without visiting the famous bagel food stops such as St. Viateur Bagel, Fairmount Bagel, and District Bagel. Moving on, the smoked meat sandwiches at Schwartz’s Deli and Main Deli Steak House are also not to miss. Different variety of poutines are spanning across different Montreal restaurants too. And if you need some fresh finds, simply head to Montreal public markets and be amazed by the great range of local and newly-harvested products. 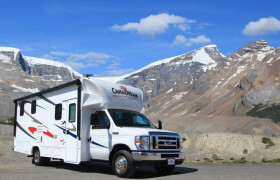 Canadream is no doubt one of the most popular choices when it comes to RVing around the scenic Canadian landscapes. A part of a renowned Apollo group, this reputable RV company with 7 branches across Canada maintains a fleet of luxury motorhomes in different sizes and styles. 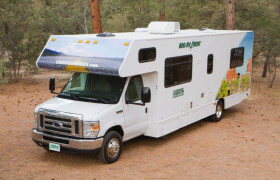 Targeting convenience through numerous branches and self-contained rentals, Cruise Canada RV Rental and Sales is part of the widely-recognized umbrella of Cruise America. A rather infamous campervan hire that lives up to its name, Wicked Campers provides 2 to 5-berth sleepers ideal for budget travellers. The controversial company has three branches in Canada and one in the US.